If this sounds like some kind of vegetarian main course at a dinner party, well it pretty much is, and most vegetarians would be really happy to be served a slice of this. You could even get away with serving non-vegetarians this dish – or just make it to take in a packed lunch for work or a spot of fishing. Preheat the oven to 180°C. Melt the butter in a pan and gently cook the onion without colouring for 2-3 minutes; remove from the heat and leave to cool. Cut the celeriac in half and slice it as thinly as possible with a very sharp knife or a mandolin. Blanch the slices in boiling salted water for 2-3 minutes. Cut the puff pastry into two discs, one about 20cm across and the other about 25cm. Lay the smaller one on a tray and prick holes in it with a fork. Arrange layers of the celeriac on the pastry, leaving a 2cm gap around the edge; scatter with some onion, a little cheese and season. Continue layering up the rest of the ingredients in a dome fashion until you have used them all up. Brush the edges of the pastry with egg and lay the larger one on top, pressing the edges together with your fingers. Brush the top with egg and leave to rest in the fridge for 30 minutes. 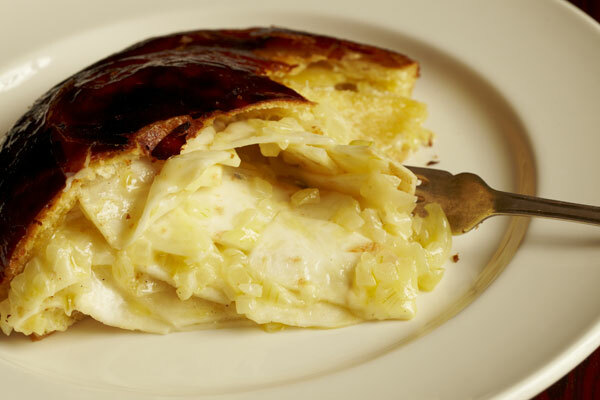 Bake for about 30-40 minutes; test with a knife to ensure the celeriac is cooked. This entry was posted on March 19, 2011 at 11:52 pm and is filed under Food with tags bake, butter, celeriac, dinner party, egg, fingers, fishing, freshly ground black pepper, lancashire cheese, layers, main course, mandolin, melt, onion, packed lunch, pie, puff pastry, recipe, salt, sharp knife, vegetarian, veggie. You can follow any responses to this entry through the RSS 2.0 feed. You can leave a response, or trackback from your own site.